I wanted to try something a little different today. I recruited my son Devin to sit and hang out watching a television show while I did a new lighting setup. 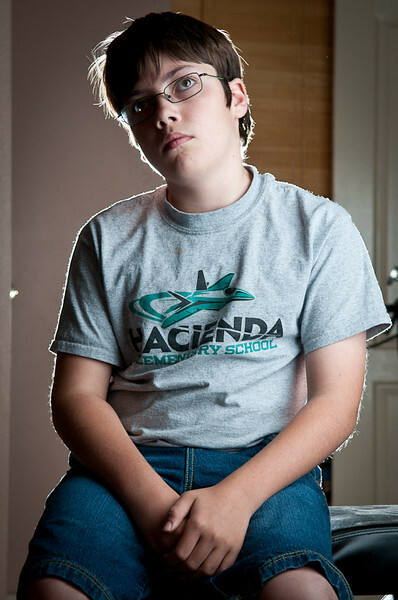 I put a strobe behind him with a 20º grid spot and then lit him from the front-right with a large softbox. I was hoping to have the background go a bit darker but considering the room and time I had this is pretty good. Bottom line it is a really good idea to play with your equipment and try something new. You can learn some great new tricks for the tool kit and although you might not get what you are expecting the effect might come in handy in the future when trying something different. The main idea here, keep experimenting and trying new things. So the lighting was an AB800 with a 20º grid on a c-stand and another AB800 with a Photoflex Large Softbox on another c-stand. The c-stand for the front was nice because it allowed me to flip the light upside down to get it lower to the ground without having to have a smaller stand.